There are a myriad stories of generation ships, following them as they take to the stars and head off to a future unknown. They seem to capture the imagination in a quintessential way, building on the idea of that limitless frontier that always holds more promise than what’s currently available. While these novels are fascinating in their own right, they tend to end just as that final goal is reached, the ship belching forth occupants who are hundreds or even thousands of years removed from those first pioneers. But what happens when the ship arrives? What if the world the descendants reach isn’t a match for the one their ancestors envisaged and then carefully planned for, and who takes up the mantle to keep that original dream alive? Marina J. Lostetter’s Noumenon Infinity answers the questions set out in her previous novel, Noumenon. The first book saw the settlers set out on generation ships. Unusually, the novel utilized clones rather than the more traditional method of producing the next generation of starfarers. The clones were carefully chosen for their suitability in a variety of professions—every gardener the same as the last, for example. The clones traveled through the generations until they finally reached their ostensible goal, a strange star called LQ Pyx that appeared to have an artificial cage constructed around it, a clear sign of life beyond Earth. It ended with the ship’s residents viewing the star, preparing to examine what the structure surrounding it might be made of. The novel also had softer, emotionally human elements, including a concern for the inevitable conflicts that would arise on a journey of that scale, but sometimes found itself bogged down by the hard science that sat in uneasy conflict with social concerns. The pacing varied—tales of rebellions and personality clashes made fifty pages vanish in the blink of an eye, while ten pages of purely technical explanation for moving through the universe often felt more like a hundred. Thankfully, Noumenon Infinity resolves those pacing issues and adds some brilliant touches to create a tight, compelling sequel. It’s less concerned with the ‘how does this work’ aspect of interstellar travel, though that is still very much present—it’s just that it is interwoven throughout the narrative to present a more compelling and unified story, avoiding asides on the precise scientific nature of space navigation that bog down the plot. Lostetter achieves this textual unity in an interesting way, throwing away conventional linear structure to create a timeline that jumps around over thousands of years. The narrative’s starting point is the earliest days of the project, before the generation ships were even launched, following researchers and financiers as they get the enterprise off the ground and face an unexpected disaster that maroons them in an unfamiliar segment of space. The second main viewpoint closely follows the actual end of Noumenon’s voyage, taking up where the previous novel left off, with the newest generations of clones trying to figure out the anomaly surrounding LQ Pyx and squabbling as they determine what action they should take next—chase another far flung goal, or stay where they are? This transitions into the last arc. Set thousands of years in the future, it follows the characters shot forward from the past as they meet the aliens they’ve searched so long for and discover that not all is as it seems. Distinctive character voices help keep these complex timelines in order; while it might initially seem confusing to have a time skip of three thousand years, the inhabitants of Lostetter’s world are so fully fleshed out that following along is easy. Characterization is where the novel truly shines. Science fiction is often all too quick to present a supposedly unified future, free of race, and, regrettably, often free of disability. This form of soft eugenics imagines that all disability has been cured or simply "bred out" of people, and that this is the ideal condition for human beings to be in. Not only is it unrealistic, but it takes away the opportunity for disabled individuals to see themselves represented in genre literature. 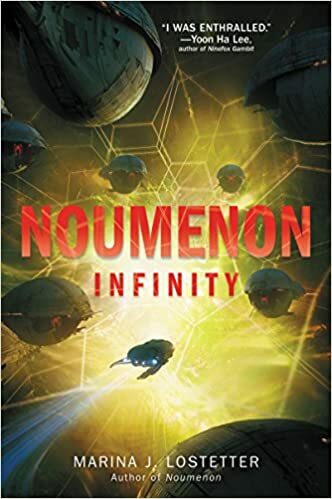 Thankfully, Noumenon Infinity is rich and fully realized—characters truly seem to come from every race and cover every sexuality, as well as a full spectrum of ability, in a way that feels utterly natural and reflective of society as a whole. I do want to pay particular attention to the representation of disability within the work, just because it’s done so well, even in comparison to the increasingly positive interpretations present within science fiction media. Lostetter’s spaceships are disability-friendly; a character in a wheelchair has accommodations made in the ship to allow her to traverse it with relative ease. People with impaired mobility often wonder how they’d navigate such environments, and this question is at least partially answered. Of course there will be a way for them to get around a spaceship—in the future, the technology for that will be developed, alongside everything else. A disabled character takes a prominent role—a deaf character speaking ASL proves key in communication issues that take place in the latter half of the book, becoming a major figure in the relationship between the aliens in the future timeline and the human residents of the past. It’s a nuanced portrait—not every character speaks ASL, showing that perhaps things can only change to a certain extent. Nonetheless, the positive representation and placement in a key role elevates Noumenon Infinity even further. There’s also an element of spirituality that wasn’t present in the first book. Noumenon Infinity questions what relationships we might have to our ancestors, especially poignant given that a majority of Lostetter’s characters are actually clones, eight-plus generations removed from their original forbearers. They wonder who they are in the context of their progenitors, trying to reconcile how each generation’s unique upbringing, with a different set of foster parents, clashes with who they were meant to be and the duties they were meant to take on. The spirituality and the science nest well within each other; there’s a reason the characters feel the connection that they do, but it doesn’t make it any less mystical. The mysticism spreads, its inception rooted in a single character, until it becomes a fundamental part of the culture of the ship, an echo of how it spreads within the real world. At its heart, the novel questions what makes us who we are. If you’re a clone, do you have to be exactly like the person you were cloned from? Where does the hard line between humanity and something transhuman sit, if it is a hard line at all? What happens when you achieve a goal that’s been in place for thousands of years, and how do you find purpose as a species after that? Separated from Earth by thousands of light years, Lostetter’s characters persevere and evolve, creating a compelling portrait that feels, at its heart, ultimately both human and galactic in scope. Elizabeth Kestrel Rogers is a graduate of the University of Edinburgh with an MSc in Creative Writing. She now lives in California, dreaming of becoming a cyborg. She can be found on Twitter @KestrelUnicorn.